Saw this on my FaceBook and had to share!!!! I had a long overdue loud belly laugh when I saw that! A lot of my friends are big foodies so it's like a collision of their world and mine. Perfection! I started gardening just because it was time the week before Mother's Day. Got the veggies all in. Then on the 22nd I lost my son so now I'm gardening for therapy. The day he died he red and white striped rose bush opened up a big beautiful rose and the day of his funer the hibiscus that my neighbors gave me bloomed a huge gorgeous golden bloom. I keep thinking that's his way of letting me know he's all right but I'm not sure what to think at the moment. During the first week or so I would get up early, go fill the bird feeders and walk through the flower gardens and then veggie garden. Made me feel peaceful. My big problem is the critters - I'm losing a lot of the front yard pretties (a burning bush, 2 peony bushes, and various others) to the rabbits. I will be enclosing the back gardens when things start coming out. Of course, I'm not sure what to do about the gophers. The day after Joseph left us, my granddaughter Shyanne told my DD that Uncle Joseph went to be an angel and had to go because he had a really bad flu (she's 4). She says she hasn't seen him since. And both DDs have said they've seen him but I haven't. The ME has not given us a cause of death, so we're still waiting. So I will be popping in and out but I'm not sure about posting at this time. I'm still in a state of shock and anger and don't want to upset anybody else with my rantings. Just had to vent when I was the post about everyone gardening. Because I sure am. Kay, I'm so sorry about your son! please feel free to come and talk about him, and how you are feeling. that's what friends are for, to listen and try to help through times like this. I don't have any cures for the critters eating up your plants, but hope you can continue to find peace and feel your son's love while you are in your garden. So sorry for your loss, Kay. Gardening is awesome therapy--it has helped me deal with the death of my niece (who I helped raise and was more like a daughter) and my mom. I believe I've read somewhere that you can use fox urine spray or dog hair to deter rabbits. Kay, I'm so sorry to hear about your son. My sympathies and healing energies go out to you. Keep gardening too, Gaia will help you to heal. I am in need of assistance in finding a name for a puppy that I have adopted. He is 5 weeks old right now, so he is still with his canine mom. He will be coming to live with me the first week of July. 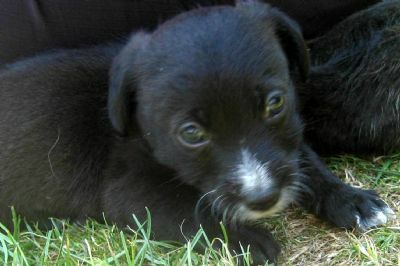 He is a terrier mix, he was the first of the litter to venture away from his litter mates. Since he so young I'm still getting a feel for his personality, I'm trying to stay away from anything that sounds like a command (sit, stay, no,etc)and anything too obvious (oreo,chess, etc). Any suggestions are welcome. I'm going to try to post a picture, in case it doesn't post, he is mostly black with white on his nose and on his chest, and some on his paws too. For the moment I am referring to him as Little Dude. He's so cute!! McCloud or Angus ;). Kay I am so sorry for your loss. How devastating.I'm sure I speak for many of us when I say, if you need to talk, we are here. Don't be afraid to rant or vent here. I hope gardening continues to be cathartic for you. Sending you loving and healing light. Kay, what dreadful news. Yes, life is part of a cycle that includes death, and without that darkness, there would be no light, but it is still so hard, isn't it? I hope you'll find comfort in your gardening, as so many have before you. We will all be sending soft blessings your way for as long as you need them. Your manners will define you wherever you go. Never forget it. How about Romeo? Wherefore art thou? I got the herbal tarot cards this afternoon. What a thing to receive right now. I am so happy. I'm still using a starter set until I get a feel for what I am doing and then I will put these to good use. I have just the most perfect box to put them in along with the rosemary sprigs that smell so wonderful. I will use them the best I can. Kay, I am so sorry about the loss of your son and for the pain you are going through. Sending good thoughts your way and the girls are right. Anytime at all you need to talk, there is always going to be someone here to listen. Boy have things been busy around here! I'm happy to have a break and to catch up. I am going back to school to earn a degree in Accounting and summer classes started last week. To say I'm a bit rusty would be an understatement! I've been out of school for 15 years and this is something else. But I am doing good. Keeping up with the homework and holding down A's. WooHoo!! Well time to get back to cleaning house. Kay, I hope the Herbal Tarot will become part of your healing. Blesséd be. Kay, I am so sorry to hear of your son's passing. Gardening is such a beautiful therapy and I hope it continues to give you peace. Jennifer - he's a sweet looking pup! Maybe it's just the picture, but he looks like he's got wise old eyes. So Sage comes to mind. Jennifer, love the puppy, have you decided on a name yet? The puppy does have a name, it's Kaz. I got it from the Polish word Okazja meaning chance or opportunity. It felt right when I hit upon that, since he's a rescue and I'm a 1/4 Polish. His foster Mom said he's already beginning to look when she calls him that. He'll be ready to come home around July 7th. I'm so psyched. Jennifer, like the name. suitable I think. He's a lucky puppy to have you for a mom. OMGosh....I lost y'all for a while...I kept waiting and waiting to hear from someone, so I decided to look y'all up and I realized I hadn't subscribed!!!! Eeepppssss! Whew! So where are the letters now? Hugs, Kay....I am so sorry...hugs, again. Whomever is handling addresses for the round robin letter, can you contact me to be sure you have the correct address? 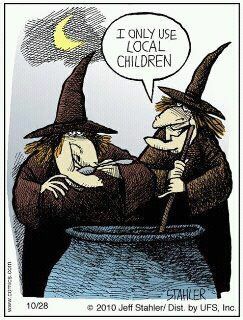 There've been a few changes in my life in the years since I became a "witchy farmgirl." Thanks! Rosemary, I have the Master List of addresses! Just got back from a three week trip to IA, WI and MN seeing all the kids/grandkids and now catching up on all the threads. WOW! After three weeks that's a big task. Kay, so sorry to hear about your loss. Know what you are going through. Not easy, but you have good friends here that will listen whenever you need to talk, vent or cry. What a cutie of a puppy. Like the name and it's meaning. Keep us posted on his progress after you get him home.